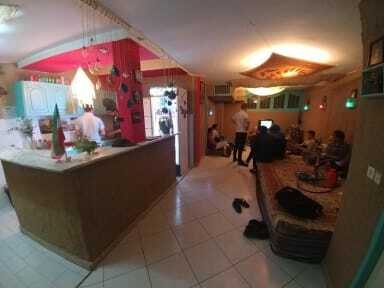 This is one of the best hostels in tehran with a great location and a very friendly and helpful owner. Definitely will come! It was fantastic staying at tehran hostel.. Location, staff, cleanliness etc everything was superb.. The host and his wife both were super helpfull, They help me for booking my coach ticket and guide me about tehran attraction. They were very kind and honest.. Only thing needs improvement is WIFI, wifi signals very low on 2nd floor. Highly recommend tehran hostel. The location of the hostel is very nice. You can walk to many shops and art galleries or you can easily get the metro line 1 which takes you to many sights in Tehran. Inside of the hostel you have a kitchen which you are free to use und more important there is a hot tub!!! Mori is a very welcoming host and a great guy. Also, there is a common room where you can hang out and watch TV. It's very comfortable there and if we come back again we will definitely stay with Mori for a third time. Great hostel that covers all your basic needs. It has a friendly atmosphere, very chilled. I had a great time there, perfect for relaxing after a day in the busy city. Location is good, quite central, you can reach many places easily from there. I found a nice vegetarian restaurant less than 10 mins walk from the hostel, it’s in an art gallery, surrounded by a lovely park. Very Nice staff and helpful. The hostel is simple but has everything what is needed. Very near from the metro and easy to find. When i come back i would gp again same place. Good, quiet location, 3min to Taleghani metro station. Comfy beds, big bathroom, great common space in the basement with TV (and sound system) to chill and hang out, free tea and yes, a hot tub! There is also a backyard where you can chill in the hot days. However we came off season so there wasn’t a lot going on, but we would recommend staying here. good location. staff are friendly. overall i enjoyed my stay there, but i want to make one negative comment. i stayed there for 2 nights. When i checked in i asked a receptionist to book my bus ticket to Esfahan the day after because she said she could do that. when i asked her a few hours later if she could do that, her answer was "not yet, later." The next morning i asked her again and her answer was same. When i checked out, i asked the last time. you can guess what she answered.